On Friday the self-styled 'world's greatest classical music festival' starts. During the 2009 BBC Proms season some fine musicians are playing some great (and not so great) music. But I am leaving most of the coverage of the concerts in the more than capable hands of fellow bloggers. Regular readers will know why. Today's Proms are the product of an organisation whose values I am profoundly out of sympathy with. Yes, I know it is the music that really matters, and much of my musical education came in the arena at the Albert Hall. But, the once great BBC Symphony Orchestra, which performs in many of the concerts, has, sadly, become a second-rate band during the deeply disappointing tenure of its largely absentee chief conductor Jiří Bělohlávek. As a venue for live music the antiquated and acoustically poor Albert Hall is long past its sell-by date. Despite the acoustic challenges, the skilled and dedicated BBC technicians capture excellent sound for the BBC Radio 3 (and TV) broadcasts, and these should offer a viable alternative to suffering in the over-heated and uncomfortable hall. But, for this music lover, the prospect of two hours of music punctuated by continuity announcements from Petroc Trelawny and his loquacious colleagues is marginally less appealing than spending the same period of time in the dentist's chair. So the BBC Proms will not be one of my blogging priorities over the summer. Instead I will be featuring some 'small is beautiful' music, starting with the beautiful CD seen in my header image. 'Dmitri Shostakovich and Anton Webern have had the greatest influence on my work. Although my music bears no apparent traces of it, these two composers taught me the most important lesson of all: to be myself'. This commitment to 'be myself' has given Sofia Gubaidulina a voice that is as remarkable both for its diversity and for its uniqueness. She manages to avoid the trap of the stylistic rut that claims many other contemporary composers. In director Akira Kurosawa's classic 1950 film Rashomon the same story is told in different ways by four different characters. Sofia Gubaidulina's music has the same, and rare, ability to tell the same story from different viewpoints. Interestingly a similar path is pursued by another contemporary composer, Vanessa Lann, who, in her notes for her 2008 Cello Concerto, cites the use of differing narrative viewpoints in two Clint Eastwood films as an influence. Anne-Sophie Mutter's recent recording of Sofia Gubaidulina's In tempus praesens with Valery Gergiev and the London Symphony Orchestra gave me a lot of pleasure. This concerto for violin and orchestra, which is scored for large forces, hardly fits my theme of small music. But a chance visit to La Roche-sur-Yonne in France in June uncovered a CD of Sofia Gubaidulina's complete works for solo piano that was new to me. The composer's 1965 Sonata, with its Cageian excursions into the realms of the prepared piano, is the most substantial work on the disc. But it is the sequence of fourteen miniature Musical Toys really provide proof that small music is beautiful. 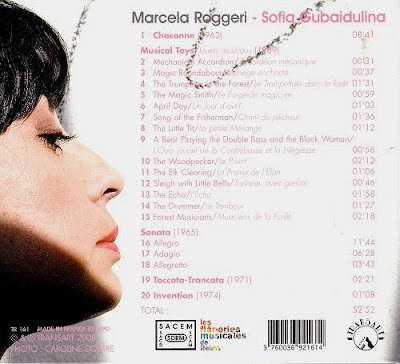 Argentinian pianist Marcela Roggeri is a passinate advocate of Sofia Gubaidulina's music, and she is captured in excellent sound in recitals at the 2007 Les Flâneries Musicales de Reims festival in Reims. The disc comes from the innovative Transart Live label which specialises in live recordings of lesser-known repertoire. 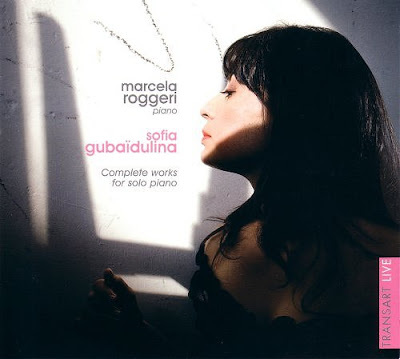 This CD of the complete works for solo piano music of Sofia Gubaidulina is resounding proof that size does not matter in music. Staying on the same Overgrown Path, tomorrow's post will feature a small but perfectly formed music festival. More on Japanese cinema and performing outside the comfort zone here. Sorry that you had to pay so much for the 53 minute recording. I believe that I have an earlier CD which includes all of Gubaidulina's piano works, but I haven't listened to it for a long time. I'm glad that you found this new one so special. Recently, I've bought several opera DVDs, some prepackaged as sets, at about $13 each, which I plan to watch and then share, and eventually donate to a library. Thanks for your beautiful post from France.